In most cases, borrowers file for bankruptcy because of their ability to discharge their debts. A bankruptcy discharge is a permanent court order releasing the borrower from the responsibility of having to pay the debt, and prohibits the creditor from taking any collection action against the borrower. However, in some cases a borrower may want to reaffirm a debt in bankruptcy, rather than discharge it. A borrower will usually reaffirm a debt when the debt has collateral the borrower wants to keep, such as a car or valuable jewelry. When a debt is reaffirmed, the borrower voluntarily agrees to pay the creditor all or a portion of the money owed. If a debt is reaffirmed and the borrower fails to pay the debt, the creditor can seek repossession and other legal actions to collect the debt. Reaffirmation agreements are completely voluntary, meaning a borrower in bankruptcy can never be compelled to reaffirm a debt. In addition, all reaffirmation agreements must be approved by the bankruptcy court before they can become effective. Reaffirmation is a good tool for borrowers, but only if it is used in appropriate situations. If the property you want to keep qualifies for a bankruptcy exemption, in some cases it may not be a good idea to reaffirm the debt. If the property is exempt the borrower will be allowed to keep the asset without having to reaffirm the debt. 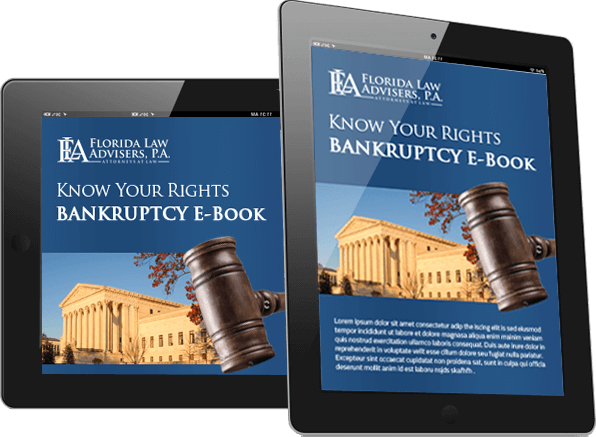 Which type of property and the amount that is eligible for an exemption will be determined by both Federal bankruptcy law and Florida Bankruptcy law. If you have questions about the type of property and amount that can be exempted in bankruptcy, contact us to speak with a Tampa bankruptcy lawyer. Most exemption questions can be answered over the phone. For more in-depth questions we offer free in-person consultations for borrowers considering filing for bankruptcy. You can also obtain valuable information on reaffirmation by viewing the Reaffirmation Guide published by the Florida Bar Association. If you are having a difficult time meeting your financial obligations, Florida Law Advisers, P.A. may be able to help. Our Tampa bankruptcy attorneys have years of experience helping people just like you solve their financial problems. We understand these are very difficult times for you and we are here to help. We have many options available that can help you successfully manage your debt and regain your financial health. In some cases filing for bankruptcy may be a good solution; however, it is often not the only solution available. The right course of action will depend on the unique circumstances of your case. Contact us today to schedule a free, confidential consultation with a Tampa bankruptcy lawyer to see what options may be available to you. During the consultation an experienced Tampa Bankruptcy attorney will carefully review the facts of your case and help you choose a course of action that is best for your specific needs.